Susan joins Covenant as an Escrow Officer after spending 15 years with Lawyers Title Insurance Corporation and Fidelity National Title. Susan’s experience will reinforce our company’s objective to provide a professional, accurate, and efficient title and real estate settlement process for our clients. 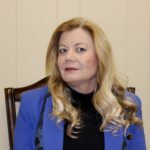 In her prior employment, Susan coordinated title search requests, determined if a property’s title had been previously insured, and administered delivery of completed title orders to attorneys and settlement agents. In her new role with Covenant, Susan utilizes her expertise to assist our clients with the entire real estate research and settlement process. She works with clients to complete the settlement process, working with the lender, attorney, and REALTOR to close the transaction in a timely and accurate manner. She demonstrates the level of expertise that will grow our operation and set the state for future strategic partnerships. In her free time Susan enjoys camping, watching NASCAR, and spending time with her husband and her daughter.